With less than 5 days of school left in the year, I have finally figured out the best snack of the year. I eat my snack at 2:45 while my kids are at special and I have been looking all year for the perfect snack. The snack needs to be filling but not stuff me, sweet but not sugary, fibery but flavorful and easy to pack. That is a lot of rules in making a simple afternoon snack. I have tried many things over the year – from fresh veggies to protein bars but they just don’t meet all of the qualifications – until now. This snack packs a lot of fiber, protein and flavor for about 300 calories. Wrap it up and enjoy it after lunch and before dinner! Great for car trips, office lunches, kids and picnics! Yesterday I made a treat I have been wanting to make for a while. I brought them in to school to see what everyone thought. 1 c. crushed peanuts (I used dry roasted) use 1/2 in dough and 1/2 on top! Mix first set of ingredients together until creamy. Add second set until thick and doughy. 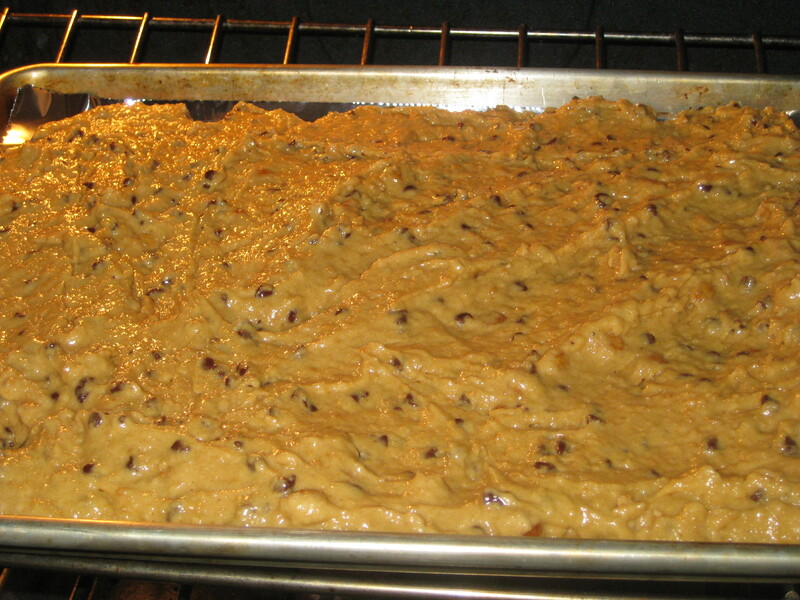 Spread 1/2 of the mixture onto a greased 9×13 pan. Cover the layer with preserves – I used strawberry then place the rest of the mixture on top of the jelly. Sprinkle the remaining peanuts on top. Bake for 45 min. at 350. Everybody said they were good, but tasted like a sandwich. The oatmeal may have made the dough taste too much like bread. I think I would try to make them with a more shortbread style pb cookie layer! ** I had this ready to post last night, but it is currently -11 degrees and our cable went out last night! Mix all wet ingredients (bottom list) together in the Kitchenaid and then add the dry ingredients. Fill muffin cups 1/2 of the way full and add a spoonful of strawberry perserves. Add the rest of the batter on top of preserves. Bake at 350 for 25 min. or until muffins have puffed up turned golden brown. Mix all top (wet) ingredients together in the Kitchenaid. Make sure the banana is well mixed and “smushed”. Add dry ingredients to the mix. Mix well. Add to small or regular muffin pans. Bake for 30-45 min at 350. There is a glaze listed in Cooking Light where you mix lime juice and powdered sugar and a little water and pour it on the bread. I haven’t done that but I plan on it!! Mix all ingredients together and bake at 350 for about 25 min. I made bars with this dough because they are easier and take less time! I cut them up and packed them to take! 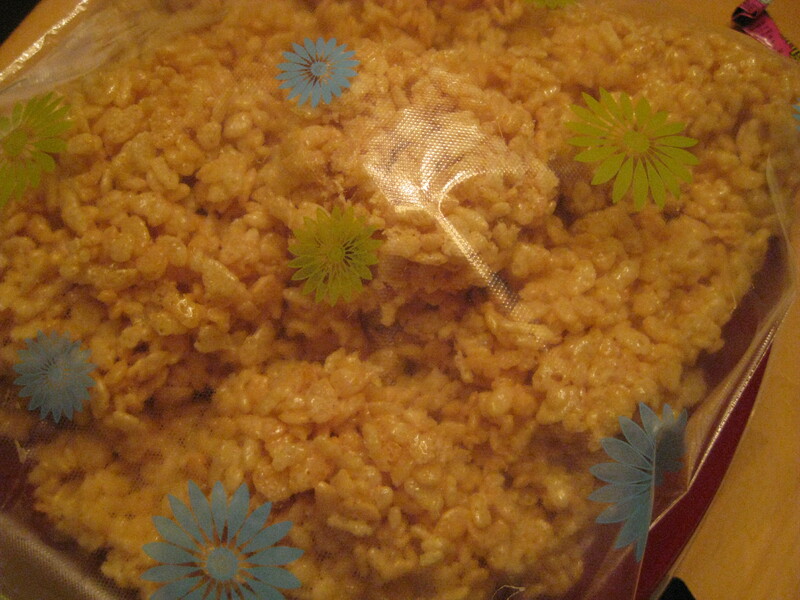 Then I made some rice krispie treats because they only take a second and they are gluten free for my cousin. Here is a pic of them packed up to go.